Graph analytics uncovers the essence of real-world networks through their connections. Businesses use these insights to model processes and make valuable predictions about how things such as information or failures spread; the flow and capacity to transport resources; and influences on group dynamics and resiliency. Forecasting complex network behavior and appropriately prescribing action, is immensely valuable for breakthroughs across science and business as well as a safeguard against vulnerabilities. Graph algorithms are the powerhouse behind analytics for connected systems. These algorithms use the connections between data to evaluate and infer the organization and dynamics of real-world systems. Neo4j graph algorithms are available as an open procedure library and easily called upon as a procedure from Cypher. This library is now also installable with a single click in Neo4j Desktop. These high-performance algorithms have been optimized for faster results and include time-saving features such as graph projection, which places a logical sub-graph into algorithms when needed. The Neo4j graph algorithms help detect hard-to-find patterns and structures in your connected data in several key areas: Pathfinding to find the shortest path or evaluate the availability and quality of routes; centrality to determine the importance of distinct nodes; and community detection to evaluate how (and how tightly) a group is clustered or partitioned. Cypher for Apache Spark™ (CAPS) is currently pre-release software that complements existing SQL-based querying against a tabular view of the same data, supporting both Neo4j as well as Hadoop data sources. Whether you are trying to build dynamic network models or forecast real-world behavior, this book illustrates how graph algorithms deliver value – from finding vulnerabilities and bottlenecks to detecting communities and improving machine learning predictions. The world is driven by connections – it’s time you leveraged the value hidden in your connected data. To not just react but predict and prescribe the best course of action, you need powerful analytics created for connected systems. 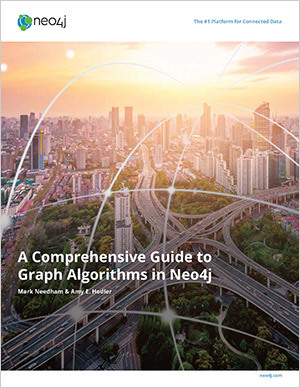 Download and dive into Neo4j for yourself – or download the white paper to learn how optimized Neo4j algorithms can help you reveal hidden insights and develop breakthroughs. Graph algorithms are the key to gaining powerful insights from connected data. Any organization today – from research labs to retail chains – that more finely leverages graph analytics arrives faster at extracting valuable insights from huge, complex volumes of data. Download this comprehensive guide and learn all about these transformative tools. 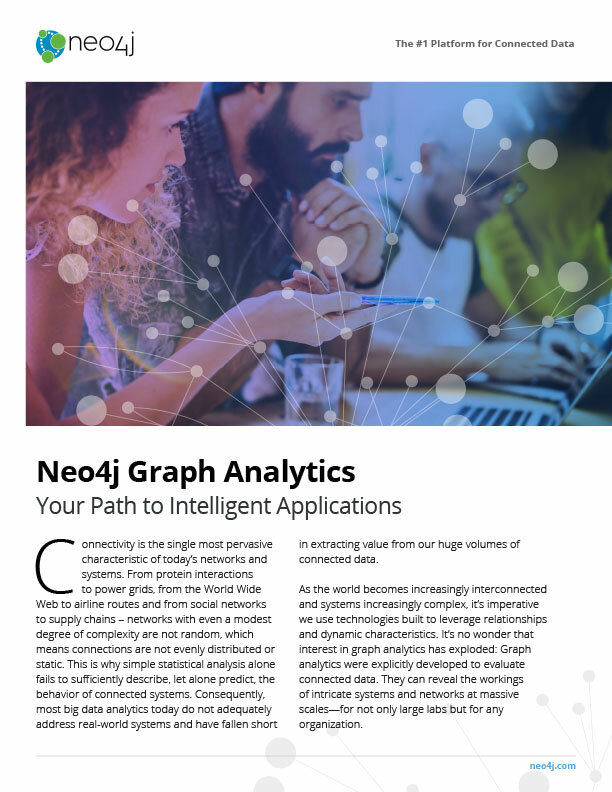 Neo4j offers a new approach so that all businesses, not just large research organizations, can embrace graph analytics and drive breakthrough discoveries. We provide a connections-first model where the value of data relationships is never lost. This, combined with practical graph analytics, frees teams to explore meaning and develop solutions. Organizations can now provide value faster without the burden of unoptimized infrastructure, complicated tools or unattainable specialists. When you leverage graph analytics that are powerful, easy to use and accessible, you simply innovate faster. Embracing more practical graph analytics will enable you to demonstrate a clear information advantage and industry influence. Using Neo4j graph algorithms, your team will uncover previously hidden relationships, structures and patterns. These new insights into how your networks and connected systems operate will lead to valuable discoveries and superior real-time operations. Greatly increase the productivity of data scientists and solutions teams by deploying integrated methods for testing hypotheses and developing prototypes – especially important for these highly iterative processes. Immediately assess results and make refinements when you include real-time transactional data into your analysis. Using a native graph platform that spans both analytics and operations enables you to move solutions into production without leaving a common environment. And leveraging user-friendly tools expands the engagement of technical staff and reduce the dependence on highly specialized experts. Read this pamphlet on graph analytics, which Gartner Research calls "possibly the single most effective competitive differentiator for organizations pursuing data-driven operations and decisions." Questions about Neo4j Graph Analytics? Contact Us.